THE TAOISEACH AND Minister for Health have sent a letter to their European colleagues urging them not to vote on a directive that would lower the size of health warnings on cigarette packets. Enda Kenny and James Reilly sent the letter, which has been seen by TheJournal.ie, to their European affiliates in the European People’s Party ahead of a vote on the Tobacco Directive. There are concerns that parliament will vote to reduce the size of health warnings on packets from 75 per cent of the front and back, to 50 per cent of the front and back. In the joint letter, the two ask their EPP colleagues to vote against the plan. “Every year, more Europeans die from smoking than from the combined total of car accidents, fires, heroin, cocaine, murder and suicide. 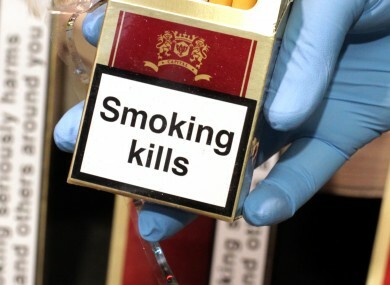 700,000 Europeans will die from smoking this year. Tackling this public health epidemic through the use of large picture warnings can become an important aspect of Europe’s health promotion strategy. “The evidence is clear: Larger warning labels are more effective,” says the letter. Reilly last week outlined moves that would see Ireland tobacco-free by 2025 and this directive would see menthol and “slim” cigarettes banned across the EU. Philip Morris International, one of the world’s largest tobacco firms was last week accused of spending over €1 million attempting to influence the vote, leading to some MEPs tabling amendments that would remove some of the more stringent parts of the directive. The Director General of the World Health Oganisation said that the tobacco industry was attempting to stop their products from being regulated. “In the case of the EU Directive, the tobacco industry is, once again, making an extraordinary effort to keep its products from being regulated, precisely because regulation works so well to reduce the vast harm caused by tobacco products. The tobacco industry is, once again, using an arsenal of economic arguments, precisely because such arguments are so effective in shifting the emphasis away from health, especially in times of financial austerity. Email “Taoiseach calls for no change to tobacco health warnings”. Feedback on “Taoiseach calls for no change to tobacco health warnings”.